Special Containment Procedures: A minimum of ten locations suitable for triggering SCP-4545 manifestation are to be maintained by the Foundation at all times. The use of CCTV cameras is to be encouraged within the civilian population, especially at locations matching the requirements for SCP-4545. Instances of SCP-4545 observed by the public are to be explained as artistic endeavours where possible; in cases where this it not feasible, witnesses are to be amnesticised. Instances of SCP-4545 manifesting at Foundation-controlled locations are to be admitted within the location as soon as they are detected. A small population of SCP-4545-1 is to be maintained for study at Site-72 (at the discretion of the Senior Researcher for SCP-4545); recovered instances of SCP-4545 and any excess SCP-4545-1 instances are to be destroyed via incineration. 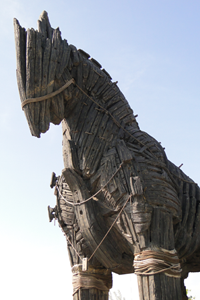 Description: SCP-4545 is a hollow wooden construct resembling a horse, which manifests outside of buildings or enclosed outdoor areas with sufficient space to fully admit it within. Instances of SCP-4545 are on average 2.7m wide, 7.3m tall and 13.1m long, and have been known to vary widely in style and construction, occasionally including visual elements made from rope or iron. SCP-4545 only manifests in unobserved areas; recording equipment or human presence are sufficient to prevent its occurrence. As such, no direct observations of its manifestation exist. Between one and three hours after being brought inside the target structure a section of SCP-4545 will open1 and begin to disgorge instances of SCP-4545-1. The number of instances is proportional to the amount of time following its manifestation before it was moved into the target structure. If the SCP-4545 instance is not moved inside the target structure it will display signs of increased pressure such as bulging and, after a certain amount of time, explode violently. This explosion is notably larger in magnitude than could be explained solely by increased internal pressure, and is capable of causing significant damage to the surrounding area in addition to scattering the remains of the contained SCP-4545-1 instances. SCP-4545-1 instances are abnormally small horses, standing approximately 35cm at the shoulder and wearing bronze barding stylistically similar to ancient Greek hoplite armour, including a notable red crest on the helmet. They display a notably higher intelligence than non-anomalous breeds of horse. Autopsies of deceased instances have revealed a hollow cavity within the torso, containing a number of partially-animate wooden horse sculptures. 1. Most commonly on the underside of the body. 2. Instances of SCP-4545-1 in containment continue to engage in this behaviour.